Train Station at Stratford-upon-Avon Railway StationStratford has a train station served by trains from Birmingham and London. Chiltern Railways - which links across to the line into London Marylebone. There is a car park at the station with 320 spaces and a ticket machine for out of hours when the ticket office is closed. 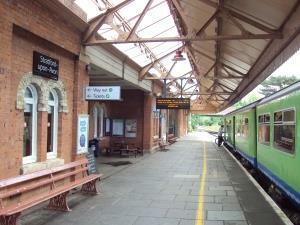 Stratford has a train station served by trains from Birmingham and London. There is also a Hertz Car Rental office at the station should you need to rent a car to complete your journey.